Amaze your visitors with beautiful and bright ceramic tile flooring in your home’s entryway, living room, dining room, or even your hallway! If you have an active household with children or pets, this low-maintenance flooring is perfect for your home. Environmentally friendly, affordable, and durable, you cannot go wrong with ceramic tile for your new floors. Easy to clean and maintain in any season, you also won’t have to spend a lot of time and money on cleaning spills or stains. Ceramic floor tiles are also cost-effective and are virtually able to pay for themselves in a short amount of time. They are moisture resistant, so they are ideal for bathrooms or areas in your home that take in a lot of water. 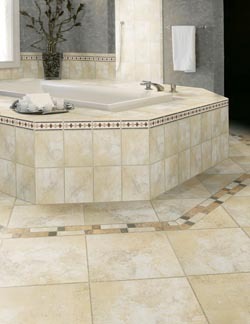 Increase your home’s value with beautiful ceramic floor tiles that are guaranteed to last for years to come. With ceramic tile, it is easy to match the décor and furniture in any room with the thousands of designs, patterns, and colors for you to choose from. Look for our Quick-Pick icons to see the range of shades and texture variations for each tile you are interested in. These tiles do not get scratched when something is dropped on them, so they are great for kitchens and rooms that see a lot of use. And even if one of the tiles is damaged somehow, it is easily replaceable with a spare tile. With our Ultimate Confidence Guarantee and manufacturer’s warranties, you do not have to pay for it if the problem is due to a faulty product or an installation-related issue. In addition, ceramic tile is also resistant to fire; it is odor proof; and it does not fade in the sun. So this flooring is perfect for any room in your home. Because it does not absorb odors or debris, it won’t collect allergens from outside, so you can breathe easy in your house. This is perfect for anyone with allergies to dust or outdoor allergens that may get caught in carpets and rugs. Join the thousands of homeowners nationwide who chose ceramic tile flooring for their new homes or to replace their old floors. Ceramic floor tiles are sometimes made out of recyclable content, making them eco-friendly. In addition, tile also helps to reduce your energy bills in the summer by making your home cool and in the winter by adding insulation to keep in the heat. Match your floors to your walls, backsplashes, showers, or countertops for an ideal house theme. With the many creative designs to consider, you can create a whole new theme for each room, all using ceramic tile. Choose your colors or patterns, tile sizes and shapes, as well as textures for each application to create new and unique flooring for every space. Contact us today to discover why ceramic tile flooring is the best choice when remodeling your home. Our flooring store serves the areas of Charleston, Mount Pleasant, Sullivan’s Island, Isle of Palms, and Daniel Island, South Carolina.